Whenever I travel to far off places I am always delighted to see the amazing work being performed by passionate artisans in every corner of the world. Traveling isn't easy--especially these days with all the hoops set up by security--but what I love most about travel is that it expands the boundaries and limitations of my own personal experience and perception. Traveling the virtual Internet, however, has made actual physical travel seem less necessary. I can sit here on the back porch in Hope, turn on the computer, and welcome in the world. A few months ago I internet-met a very special chocolate artisan who e-mailed me about his work and offered to send samples. I'd now like to share virtually with all of you what a treat they are. Chef Eric Cayton uses my favorite milk chocolate: Max Felchlin's Maracaibo Criolet from Switzerland so it is no wonder his milk chocolate bonbons pleased me the most. But I urge you to try the dark chocolate bonbon collection as well as he also uses the Felchlin dark chocolate which he writes: ...is considered among the very finest estate-class chocolate in the world, and is produced from a type of criollo cacao that is genetically very similar to the same type of cacao that the Mayans and the Aztecs would have consumed. This particular origin is called Arriba, and it's a 72%, and you are definitely right about the extremely strong flavor profile... For those of you who maintain that you don't like white chocolate you will be surprised by Chef Cayton's creative use of it. 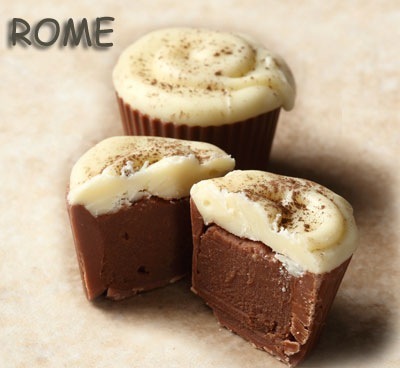 The white chocolate he uses from Felchlin is called Edelweiss, and is very creamy and smooth without being overly sweet. In addition to the luscious Swiss chocolate, Chef Cayton puts the very finest ingredients into his bonbons, such as organic certified cream, and what is no doubt the most important ingredient of all: love. 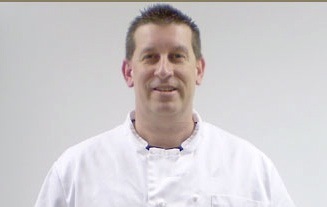 Chef Cayton is located in Derry Church Pa, a small town in a farming community settled in 1724, now called Hershey because that is where Milton Hersey started his chocolate empire. I hope someday to visit Chef Cayton at this chocolate Mecca "in person." 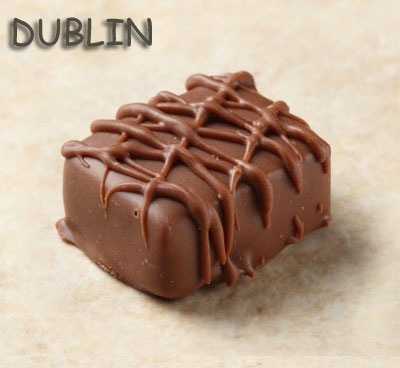 You can order his bonbons on line at: http://DerryChurchArtisanChocolates.com Click on each bonbon to see deliciously detailed descriptions plus historical vignettes behind the inspiration of its name. 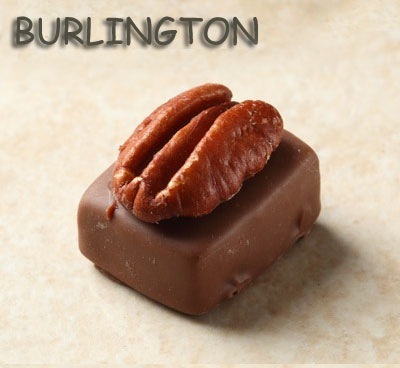 Here are 3 more of my favorite bonbons:Burlington: milk chocolate ganache, Vermont Maple Syrup, and pecans (My husband Elliott said he could become addicted to these.) Dublin: milk chocolate ganache, Bailey's Irish Cream, and coffee Rome: milk chocolate ganache, Italian espresso, and white chocolate mousse topping--a riff on cappuccino Note: I asked Chef Cayton how his business came to be named Derry Church and his answer along with personal history is such a great American success story I am adding it here: I named this business Derry Church, is because I'm 5th generation Derry Church, Pennsylvania, which is the historical name for the small farming community that became modern day Hershey, PA. 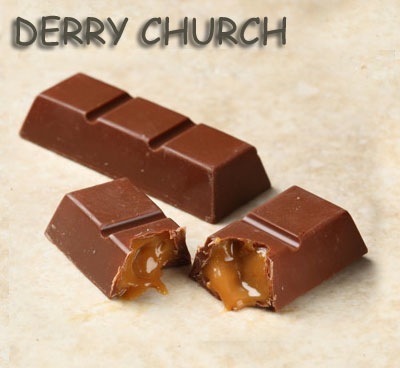 I had ancestors living at Derry Church at the time of Milton S. Hershey's birth in 1857, and many of my ancestors later worked for Hershey in his original chocolate factory. My Great Grandfather, Robert Hoover, was a stone mason, and a dairy farmer. He helped Hershey lay the foundation for his factory in 1903, and also sold the man milk for his milk chocolate! For most of the 20th century, most of my family worked for Hershey, and I have some cousins that still do to this day....so I have always been fascinated with the business of chocolate, and even as a small child I would play around with chocolate in my Grandmother's kitchen.